Jake Stratton-Kent’s (JSK) Encyclopedia Goetica comes to a phenomenal end with this double volume. As he puts it himself, the first volume on the True Grimoire provided a map of the Goetic universe, the second double volume Geosophia took us on a vast journey into the actual territory. It allowed us to re-encounter much of our magical origins in the West, of the ancient myths and stories required to initiate a modern revival of 'conjure magic'. The third and final installment, TOCM, introduces us to the hero of this tradition, the trickster in disguise, the goetic saint who best embodies this underworldly tradition of the West and whose mythical blood preserves the myriad of spirit voices that live and thrive within it. In a not at all metaphorical sense JSK’s final double volume is an expedition into the ancestral blood-ties of this famous sorcerer-saint. To embark on it is to encounter Cyprian the Mage. Not only as the hero of an ancient polemic against the last surviving pagans, but more importantly as a still present inner contact, a powerful spirit in its own right. Cyprian in this regard is the literal end of the Western occult Ariadne thread, woven unknowingly into the gown of the Christian church. It is this thread that JSK picks up and follows masterfully - and thus leads us back through millenia into the chthonic temples of our past. Following his book with head and heart is an act of magic in itself, of conjure magic, of raising the dead from the shadows. Reading this book, remembering our own Goetic past, thus turns into a necromantic act in itself. By the time we finish the second volume, if we took a family photo of the spirit-ancestors TOCM helped us reconnecting with, we'd see a vast crypt filled with relatives: closest to the front we'd find the majestic four kings and queens of the cardinal directions, right behind them the rows of the 36 spirits of the decans, followed by the 28 lunar mansions. Behind these still we'd make out slightly less familiar faces: we'd see humanoid forms wearing the heads of dogs, of lions and dragons. Or none at all, like the ancient headless one, the Akephalos buried deep in the past of our lineage. JSK calls these spirit ancestor the 'dramatis personae' of the goetic myths. But maybe we should begin to think of them as family again? Not only because this is precisely how the hagazussas, the old European witches thought of the 'familiar' spirits they held long-lasting relationships with. But because the idea of 'family' evokes so much of what was lost in Western magic over the last centuries. Let’s do a little experiment. Just think of your own family for a moment: Chances are it is a rather small circle when you only think of the ones who live with you on a daily basis. Yet the circle expands as soon as you include more distant relatives. And it truly opens up into a vast ocean of lives once you think of all the dead who walked before you and who are still remembered in your blood. — Truth be told, many of the people you think of right now might piss you off just as often as they amaze you, they might be as much a burden as a source of love, as much pain as gain. And yet irrespective of these bitter-sweet connections, we are all tied to them for good by the lines that run deep through the story that unites us. That is the story of our ancestors and family. The further you stretch out your memories into that ocean - of family members both living and dead - the fewer of them you'll know from direct interaction. The further you are separated by time and space, the more you'll work through the agency of others in order to still connect with them. You turn to your parents to remember your grandparents and to the latter again to recall echoes of their parents. In this way you and your family form a living chain, stretching out into the future as well as into the past. Not at all through your own power is this chain upheld, but through the agency of the ones who have come before you. By reading TOCM it is precisely this iridescent nature of family that JSK reconnects us with, yet obviously on a deeply magical level. For so long spirit hierarchies have been misunderstood as hierarchies of powers alone. As networks of technical interfaces that we 'dial through' in order to materialise our personal agendas. Something deeply magical - shamanic, to be more precise - happens when we begin to rethink these spirit hierarchies not as ancient telephone books but as forgotten family photos - providing a vast vista of the spirits who once walked amongst us, now stretching out further and further into our past. Replacing the idea of a 'hierarchy' with 'family' also allows us to see something else: just like in our actual families, every member of the spirit hierarchies is a being in its own right. A being with personal motives - some of them stable, others fleeting and momentarily - undergoing change and evolution as all individual beings do. See, when you were a boy or girl of thirteen you had very different needs from the person who you are today. In the same way do the spirits of the dead continue to evolve: some turning into daemons or heroes, some merging with mountains or rivers, others ascending high or climbing down deep on the sublime rays that hold together all of creation. Nothing is ever stable in the world of Cyprian the Mage. And it is through this lens that the 'spirit hierarchies' provide not technical instructions but partly ancestral, partly mythical orientation. Just like the faces on a faded family photo, the names of the spirits are here to remind us: About the risk that they might turn into nothing but dead names, unless our hearts and hands conjure them back into everyday life. After all we - the living - are the only gateway into the present world.Just as much as the dead are the only gateways into our mythical past. While exploring this heritage of Cyprian the Mage JSK emphasises repeatedly the critical importance of eschatology. Literally the term translates as 'knowledge of the last things' and thus in a Christian context has come to indicate the study of death, judgement, heaven and hell. What JSK really is pointing though is less the Christian connotations of the term, but the unfortunate fact that even for most magicians today these are the only connotations the term holds. Once upon a time our speciality event, today the study of the dead has almost vanished amongst the tradition of the West. Instead, absurd terms such as left- or right-hand are used to express personal preferences or ethical considerations of one's magical path. Choice and personal expression has gained the upper hand over what once was a foundational pre-requirement for any kind of magic. Without ‘necromancy’ in this purest sense of the word true magic would have never gotten anywhere and certainly not lasted over millennia. JSK provides countless examples of the significance of eschatology in magical practice. All of them lead the careful reader to dismiss the artificial duality that has taken such a stronghold in ritual magic at least over the last 200 years: The duality of thwarting angels and treacherous demons, of medieval monks trying to stay within the tight moral boundaries of their time and yet attempting to wrestle down that ancient beast called Goetia; the duality of our love for power that has left such a lasting mark on our craft and yet our complete inability to walk naked amongst the spirits and to simply listen. And yet, there is still more to the importance of eschatology than just overcoming stereotypes that have long begun to cripple our craft. Without a thorough understanding of 'the last things' it is actually impossible to form a holistic spiritual paradigm of the world one lives in. Despite the sound of the term, eschatology is nothing abstract at all: It refers to our practical understanding of where the dead go, of how they continue to be amongst us and how they turn into powerful thresholds - adorned by our own blood - leading out into the openness of all other spiritual beings, celestial and chthonic alike. (1) Early on in the first volume JSK provides astounding historic evidence for the long standing tradition of perceiving spiritual beings in bodies of geometrical shapes. Through this evidence he manages to interpret the cross-symbol used by Justina as a form of powerful magic, rather than a symbol of faith alone. As mentioned in a previous post on the sorcerer-saint, this further emphasizes the fact that the entire legend of St.Cyprian illustrates the battle between two forms of magic - an ancient pagan and a newly emerging Christian one - rather than the condemnation of magic as such. (2) From the old grimoires JSK uncovers the simple yet powerful technique of 'raising the plants'. For me a new ritual cornerstone not only in the process of crafting talismans, but in reconnecting the chthonic realm with the celestial through my own practice. Of course he also provides an entire lexicon of plants, stones and animals as they relate to the spirits of the decans. (3) As mentioned above, JSK manages to unlock the mystery of spirit hierarchies and fills it with true practical meaning. His detailed explanations on this matter rank amongst the true highlights of the book. Here his academic and practical magical skills blend in the most beautiful way with the exegetical shape of the book; intersecting his own voice many times with long paragraphs of the original grimoires. (4) His study of the Decans of the Zodiac provides an immensely important shamanic rather than classic-astrological reading of these ancient celestial deities. As we will see in the following point, JSK's extraordinary findings are in surprising harmony with the German magical tradition of the rulers of the earthbelt-zone ('Herrscher der Erdgürtelzone'). First outlined by Rah Ohmir Quintscher in the early 1920s this tradition knows 360 spirits - i.e. ten individual beings per decan - that surround the earth in a 'belt'. Each decan thus turns into a composite or hive being, made up by ten of the rulers of the earthbelt. Despite the obvious differences in source-materials, the way these beings operate and rule over the sublunar realm is explained exactly the same way in JSK's reading as well as in e.g. Emil Stejnar's book on the matter. This is in so far surprising as Quintscher's as well as Stejnar's works are still mostly unknown outside of German speaking countries. (5) JSK digs deep into the problem of how spiritual beings actually connect with the human mind and body. As part of his exegesis of the Book of St.Cyprian he uncovers the elemental forces as actual spirit-cells very similar to the German magical tradition best known through Emil Stejnar. This simple fact in itself overthrows the relatively recent overuse of 'banishing' in ritual magic. As mentioned just recently in a related blogpost: If all of our mind and body is made up of actual living spirits, what is there left to banish anyway? A river cannot be afraid of losing its shape; it creates it by pushing onwards. (6) JSK discovers deep ties between Cyprianic material and the magical technique of skrying. Keep this one in mind. We will understand its relevance once I had sufficient time to work on an upcoming essay on the German Cyprian tradition. Unfortunately for now translating and cross-referencing the German material will still take a few more months. (7) As mentioned above one of the many lasting legacies of TOCM will be its further re-establishment of strong shamanic foundations to our Western magical craft. In this light the repeated emphasis, examples and illustrations of the appropriate use of intermediary spirits in ritual magic is of critical importance. The singular over-use of the Holy Guardian Angel in this regard is a rather sad and modern testament to the lost adaptability of a once living tradition of deep and yet manifold spirit alliances. I guess JSK's Testament of Cyprian the Mage is what people call an instant classic. Yet for the practicing magician it is so much more than that: it is an invitation into a land most of us had believed long lost. — Happy Samhain 2016. Finally, no Scarlet Imprint book review can close without mentioning the absolute stunning quality of this double volume. Of all the standard hardcover editions Scarlet Imprint have released since 2007 this has to be my favourite. 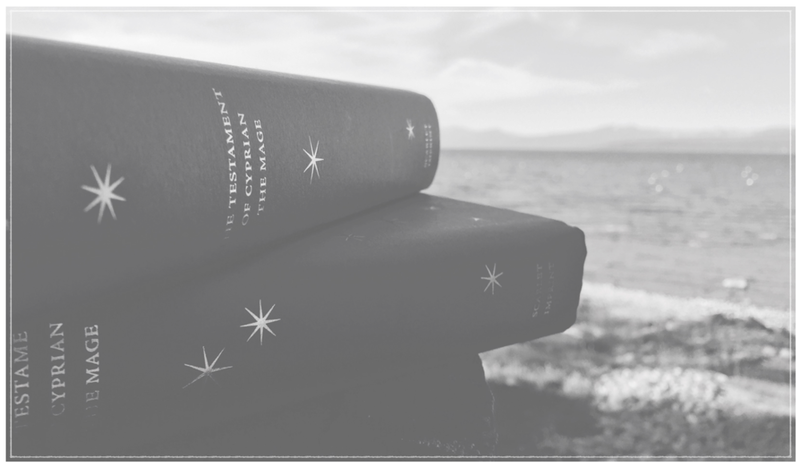 The cover design of the 'Starry Heaven' edition speaks so well to the spirit of the book - both volumes wearing the same golden stars on deep blue ground and yet both being completely unique in the constellations they represent. Completed by the amazing typography, the rough haptic of the thick paper as well as the few intersected images by Oliver Liebeskind these books are turned into unique talismans of grimoire lore. -- In other words: Shut up and buy.